Mr.Narendra Modi’s road shows abroad! The promises and the performance on the ground. Of course, as we write Mr.Modi, the Indian Prime Minister, is making more news abroad. He is there on extended road shows, it seems. He is everywhere. In Varanasi today, Myanmar tomorrow and Melbourne and Sydney and off to Fiji. 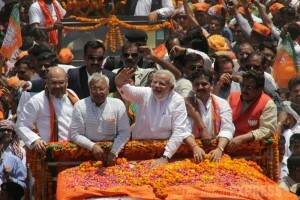 As far as road shows go this side of his performance has no parallel in recent Indian history. Of course, we had had past leaders like one Gandhi or a Nehru. Even Indira Gandhi didn’t have this luxury of enjoying and demonstrating of power in such razzle-dazzle of sartorial variations, as one news column put it. How many times the Indian prime Minister in the past had ever had the attires changed in a day? Never. Obviously Mr.Modi enjoys power and in displaying it in style. We have to concede ground for Mr.Modi for whatever value it might have. Now, what are the gains the Indian Prime Minister had got for India? Many, it must be said. First, he took India to a new height of world attention. He is also canvassing hard for his original agenda of FDI and many other benefits. Now, Australia promise uranium we can expect our nuclear industry might proceed with its agenda. As for his other successes, he had really won the hearts and minds of the overseas Indian population. In fact Mr.Modi had already displayed himself as a Prime Minister as for the non-resident Indians as he is for the resident Indians as well! Now, back at home he is faced with an enormous task of restarting the economic engine. Has he succeeded in the first six months at any rate in his original mission? The black money? FDI? And in restarting the stalled infrastructure projects? As per the latest data available, the Centre for Monitoring Indian economy and other sources, there is a huge over-run of costs of the long delayed projects. Of the 613 Central government infrastructure projects a staggering Rs. 5.7 lakh crores is required. Rs.5.5 lakhs crores had already been spent. Some projects are running over two decades without any light of the completing dates! The cost of over-runs is as much as, to put it in a populist term, building 1.5 crore houses for the rural poor! So, Mr.Modi has a great deal to deliver on his promises. Yes, his Australian visit has been highly visible. So much good we can expect. But at the same time some restraint is called for. In spite of the hype and hoopla, we have to note that the Indo-Australian bi-lateral trade is just 15 billion dollars while that of the trade between Australia and China is 150 billion dollars. All this doesn’t mean we have to underestimate the goodwill Modi has created between India and the Australian Diaspora. These are all nitty-gritty of actual governance. There are other emerging issues. The UP Governor, Ram Naik has “hoped that Prime Minister Narendra Modi would pay attention to the complex issues”(The Hindu, November 18)The Ram Temple be built to fulfil the aspirations of the Hindutva crowd? The Governor paid a visit to Ayodhya and said this. The newly inducted junior Cabinet Minister Sadhvi Niranjan Jyoti from Fatehpur had also spoken about the temple be constructed and “it was the duty of all countrymen”. Is there any hidden agenda here? One has to ask this rather sensitive question. The Barbi Masjid at Ayodhya was mentioned in a prominent way. The RSS, the VHP are also demanding, though subtly and also in not so subtle manner some of the voteries. Also, are issues like further agenda of saffronisation of education, rewriting history etc. Of course on the more substantives and subtle issues like democracy, seculairism or communalist agenda and of course a range of issues from corruption and non-performance of the new ministers. Development is a word Modi made much of. But then what is development? It can mean many things to many persons. Development is a word that camouflages many tricky questions. Development forward or development backward? In what category the Ram Janmabhoomi issues can be placed? Development is not just economic development alone. It is also a political agenda and a social and even religious- religion-tainted agenda as well. A senior minister of Akhilesh government had questioned these statements. Very soon Modi’s foreign travels would slow down and slowly the reality would hit the government. As one editorial in a leading newspaper states the time has come to stop accusing the previous government. The new government has to face the reality of land acquisition for the infrastructure projects, environment clearance, funding, why even the FDI inflow etc would have to be addressed. Not the least is the much more ticklish issues like imposing taxes on foreign MNCs. We had lost the Nokia, we had also hurt the operations of other MNCs, and Vodapone is one such case. Now we see the oil MNC, Royal Dutch Shell Group which won a tax case involving Rs.17,920 core transfer pricing case. Every MNC, the established or the forthcoming ones would study the Indian taxation mess that we ordinary Indian citizens go through every day. Modi has to streamline the bureaucracy, not an easy task. To cut down red tape, to speed up decision making will call forth his physical presence at the PMO. Are we right to tell the readers that so far, after six months in office, that Mr.Modi hasn’t brought back one single rupee of black money! Are we right in calling forth the truth that after six months in office Mr.Modi, despite his shows abroad and rock star ratings he hasn’t brought to India one of FDI? Yes, Mr.Modi has to prove his credibility. He is still on trial. He would be scrutinised for his words and actions. Whether they match or sound discordant.